Word is that No Man’s Sky is may be a disappointment, so I guess it’s time for everyone to transfer their unrealistic expectations and hype to some other game. Will you find that game in this news round-up? Maybe. This week, The Witcher 3 gets its Game of the Year edition, Rocket League puts on cartoon boxing gloves, BioShock gets a facelift, and Endless Space 2 teases Early Access. Ah, there’s the space game we can all get hyped about. This is your gaming news for the week of August 8 through 12. 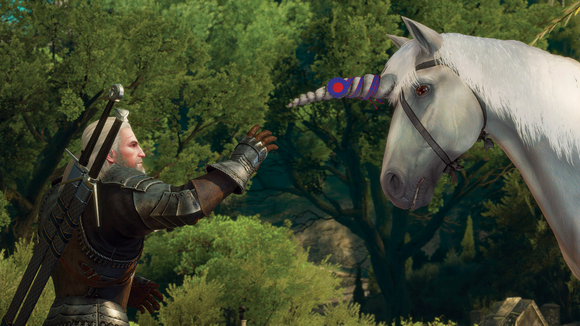 With The Witcher 3 properly wrapped up and both its expansions released, it’s time for a much-deserved victory lap. CD Projekt announced this week that a Witcher 3 Game of the Year Edition is incoming, and soon—it’s due to release on August 30, and includes the base game, all of the free bits of DLC, and the two expansions, as well as (according toEurogamer) further changes to the interface. Standard Rocket League feeling a bit stale after a year? Not to me, but hey, I’ll take a new mode anyway. This week, Psyonix announced the new Rumble mode, arriving sometime in September. The main feature is unique power-ups, like a cartoon boxing glove with which you can punch the ball, or one that lets you freeze the ball in its tracks. Not much to say about this one except I was browsing PC Gamer this week and it caught my eye. The animation is gorgeous, and Broken Sword’s Charles Cecil is consulting on the project, so that should be enough to get point-and-click fans excited I think. Hard for me to believe BioShock is almost a decade old. It’s true, though! And while I’m sure your PC still runs the original just fine, I won’t deny I’m tentatively interested in 2K’s spit-shined remaster, especially since it’s free to anyone who already owns the game—as is a remaster of BioShock 2, for that matter. Anyway, here’s a trailer showing off the new-and-ever-so-slightly-improved Rapture, in all its oppressive gloominess. BioShock: The Collection launches September 13. Maybe you forgot Call of Duty: Black Ops III was getting a Zombies expansion featuring dragons. I certainly forgot. Regardless, it finally launched on PC this week. Here’s the trailer, if you want to marvel at how dumb (in a good way, maybe?) it looks.